Moonshine life refers to a position where a (seemingly) dead group with a false eye in ko cannot be captured, because the owner of the group has an unlimited number of unremovable ko threats. An example position is given below. The question here is: What is the status of the white group in the upper left corner, given the presence of the group in the upper right? Dead - one eye dies. Seki - White cannot make two eyes but Black cannot kill, because White has infinitely many unremovable threats. Alive - the white stones cannot be captured, so the "eye" should be worth 1 point. Now, White retakes the ko with . Black could, if he wanted to, then play , forcing , and returning to the original position. After that, black could start the cycle again by capturing in the upper left. Note that is prohibited under super ko. So under rules using superko, white cannot win the ko in the upper left, because the white group in the upper right will die. After , if is prohibited, the white group in the upper right will be captured, and since that removes the source of the unlimited ko threats, the upper left can then be killed as well. This is another position which falls under moonshine life, except this time it is self-contained. Because of the unlimited ko threats at the marked points, white can never win the ko at a, and so can never capture black. Again, under superko, the black group cannot win the ko and is dead. luigi87: This looks more like a triple ko to me. Bill: If White starts the ko it is a triple ko. If Black starts it it is a double ko. Bill: By Japanese rules Black waits until the suspension of play and, in hypothetical play to determine life and death, takes the moonshine ko. White cannot take it back except by a pass for it, and if White does so, Black captures White's group. So the group is dead. It is true that White can cause problems in the hypothetical play by taking in the double ko seki, forcing a Black reply, and then passing for the ko Black took in the double ko seki. 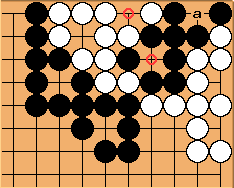 To protect himself Black must pass for the ko White took in the double ko seki, and does not have time to capture White's group in the top left corner. In theory, White can keep this up indefinitely. It is a known flaw in the Japanese '89 rules. Herman: Addendum: the same is not true for the self-contained version. In that position, if white takes at a, and black exchanges the ko-threat and response in the double ko, black's whole group will still be in atari, and black is out of options. It seems to me (HoverSink?) that of the four options listed, we only have to consider #4. Since Black can always insist on playing into the triple ko, the position must be treated according to whatever rules we happen to be using for complicated ko. If we used any other reasoning to come to a different conclusion, we would be forced to then change our ko rules in order to keep the game self-consistent. So, by Japanese rules, would probably result in a voided game. Using a superko rule, would not even be allowed. This problem would then be like the eye shapes reducible to the bent four in the corner; White will eventually become exhausted of all external ko threats, and be powerless to stop Black from playing the ko and winning. So, in other words, since I am much happier seeing groups dead than alive (so long as they aren't mine), I would probably call White dead. Tderz to HoverSink? : Also options 2 and 3 are possible (perhaps only under Go-rules where you play it out). Imagine Black had won anyway (say by B=z+komi+y+a+b+c points), even without capturing the white stones. Then it is better for black to offer White (or the referee) options 2 or 3. By not forfeiting the game by triple ko, black wins it straight away. Does either player want to fight over ? 2a) If Black does not need it, y above seems to be y = 1. 2b) Either player needs it => Rules questions? Triple ko escape for white? ... for Black? 3a) White claims to be alive and claims the point at a. 3b) White also claims the point at b. Value c is for possible Rule-depending points from the other cyclic or seki positions on the right or elswhere, helping to create the problems. c won't exist under Japanese Rules. 1) White must be dead as is: B=z+komi+y+a+b+c = 10+6.5+0+1+1+0 = 18.5 points. Black is most probably < 12 points down on the board. Black had to be 18.5 points ahead to avoid all types of discussions. 2a) B=z+komi+y+a+b+c = 0+6.5+1+0+0 = 7.5 points. 3a) B=z+komi+y+a+b+c = 10+6.5+0+1+0+0 = 17.5 points. Black had to be 17.5 points ahead to avoid all types of discussions. 3b) B=z+komi+y+a+b+c = 10+6.5+0+1+1+0 = 18.5 points. Black had to be 18.5 points ahaead to avoid all types of discussions. You generally need to live locally (eg having 2 eyes). But there is indeed 1 special way to live - live globally! You are sealed in a small place. Not enough eye-space, not live with (ie seki) your besieging group. But you are seki with the whole board. I think it requires sophiscated skills to set up and make moonshine life. And the occurrence of this makes Go more attractive and complex :-P.
I would like to grant a seki to this great player! "Dead" or "no result" is simply a vote to discourage this marvellous skill. iopq: Well I think it's dead because, otherwise, what's stopping white from claiming all corners and sides with false-eyed groups? In fact, by the Ing Ko Rule white is dead because she can't keep Disturbing Ko. Curtmack: Based on what iopq said, I'd rule no result, if I had to. As long as either side refuses to break off the kos, I can't think of any reason not to call it a triple ko. Of course it wouldn't matter if superko rules are in place: whoever runs into the superko first loses. Chris Hayashida: Does anyone know where the term moonshine life came from? Bill: I believe this is the Chinese: 假生 (From the Ing rules at http://go.yenching.edu.hk/yingrule.htm ). Altavista translates the characters as vacation life. Perhaps Davies coined the term moonshine life. MrTenuki: As in the case of 假双活, the character 假 here takes the 3rd tone. Thus 假生 means "false life" in this context. I just ran across this phrase, too. 雙劫假生 . I'm not sure, but does it mean double ko false life? SoRight? : So if one disallows triple Ko(three active Ko yield a draw) then a cunning player who has lost a game may be able to introduce enough Ko's with enough territory at stake, and if the winning player isn't wise enough to resolve the Ko's in a timely manner then the result is a draw. Bill: I am not sure what you have in mind, SoRight?, but the triple ko in Moonshine Life is not fightable except at the end of play, because one player has no threat except to leave the triple ko on the board.